Preventing Suicide in Young People & Children is a one-day conference that will be held on Monday 23 April 2018. 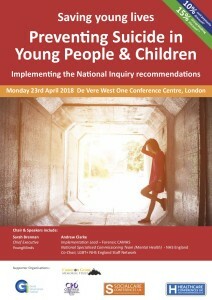 Speakers include Sarah Brennan, Chief Executive YoungMinds, and Andrew Clarke, Implementation Lead – Forensic Child and Adolescent Mental Health Services, NHS England. For full details, download the conference brochure or see the conference webpage where you can also book online.